I am on a roll this morning... I got up and made cinnamon rolls for my family, made me an awesome cup of coffee and designed (and finished) a baby thank you card. I really struggled with a design for Tracy's swap - but this is what I finally came up with. 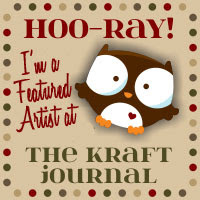 My friend Jackie picked up this stamp for me at Hobby Lobby - sooo sweet. I grabbed the blue with white polka dots paper from my LSS - it's a Frances Meyer design and of course the ribbon came from the latest trip to the ribbon outlet. The picture doesn't do the ribbon justice at all. It's a shimmery blue organdy ribbon that is just precious. I see I'm over 3000 hits now, please leave comments. Check out what I made! 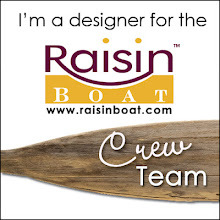 I am part of a yahoo group that does challenge cards twice a month. I posted one a couple of posts ago (My Birthday Present) and this one totally baffled me - but it's awesome! 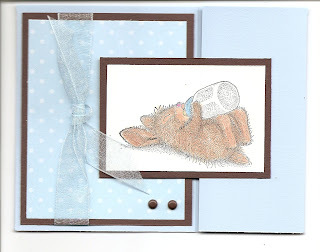 This is the front of the card. 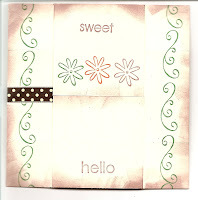 I used (retired) Sweet Shapes and this really cool flower that I got in one of my many swaps. 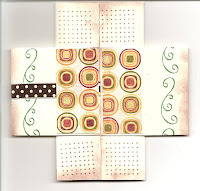 I also used some great ribbon I got in a Color Me Happy box. This ( >>>) is view two. Open the card to the left and the right and this is what you see next. The colors I chose are: Very Vanilla for the base. The ink color is Close to Cocoa, Pumpkin Pie and Garden Green. Can you tell I am ready for Fall? (<<<) Now you take the middle panels and open up and down to expose the next part of the card. (>>>) Open up the middle flaps again to the left and right and this is your next view. Open those flaps to the top and bottom and you're back to the first view. 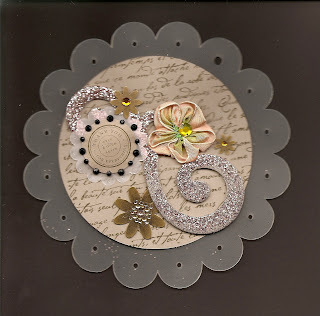 I really enjoyed making this card and I found an awesome blog that has video tutorials for this card and lots of other great ones, too. 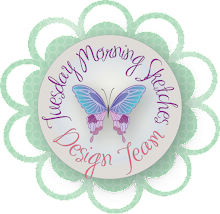 You really need to take the time to check out Dawn's Stamping Thoughts. Her tutorials are very good. Recently I participated in a Secret Girlfriend swap. 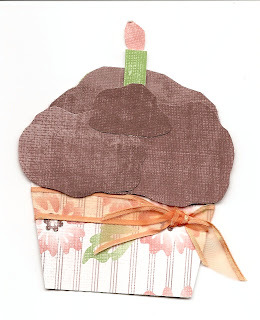 For this swap you send a gift for everyday for a whole month, it sounds like it's expensive and I suppose it can be, but when you're a part of the crafting world, you well.... get creative. I had the absolute best time giving to my secret girlfriend, which turned out to be I was her secret girlfriend, too! We spoiled each other!!! It was absolutely the best round and I'd partipated in 2 others. I scanned it in because I'd hoped it would capture all the detail and it doesn't look too bad, but in real life, it's breathtaking!! I put a piece of black card stock behind it because the base is a plastic coaster that's pretty much clear. I just discovered these in the TAC catalog... so cool!!! The back of the card has her message. 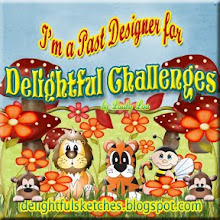 And thank you Jen for giving me permission to share your lovely creation on my blog. Hi Everyone! I hope you all had a great week. My days are very stressful at work right now but hopefully there will be a change soon. You pull the sides out and out pops the rest of the message - it's one of my favorites. I'm pretty sure I shared this before, but the inside says... "is not measured by the number of breaths you take, but by the moments that take our breath away." I hope you enjoy my card as much as I do! 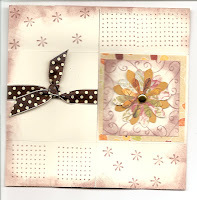 BTW, the tutorial that I followed for this great card can be found on this great blog. Holy cow! 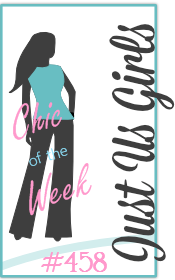 It's been two months since I've had a blog entry! My goodness.... OK I have some to things to share. 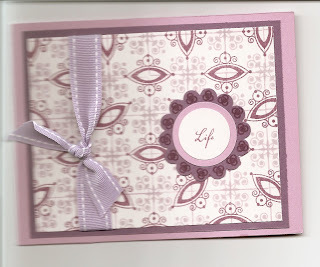 First, the bad news... after 10 years of being a Stampin' Up! demonstrator, I have given it up. It just got too hard to keep that going, family, my job and my swaps. 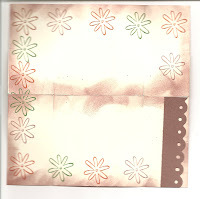 I also found where I wasn't enjoying stamping as much, it was a job. I will miss the monthly magazine, the free catalog every year and the 20% discount, but I'll live. The really bad news... I just had another birthday! Ugh! But I did have a lovely time with my family and I received some wonderful gifts. My sister gave me a Color Me Happy gift pack... I got PaperTrey Ink stuff.... the new Guidelines stamp set, 5 rolls of ribbon, a Pallette ink pad and cardstock in the Lavender Moon color. So beauty-ful!! 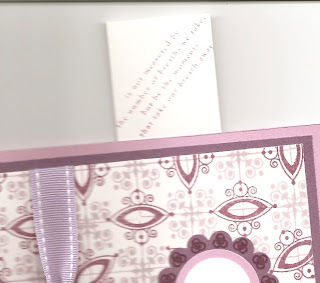 It came in a purple canvas tool caddy that is lined with black fabric and polka dots (see Jones, it really is a color) and purple rhinestone bling! My children gave me a card that when you open it there is a sound thingy in it and plays Shake Your Groove Thing! How awesome is that!! They also gave me candles. My mother gave me more favorites... a Key Lime Pie and a bottle of Beringers White Zinfandel. Yum! To explain the yummy card! I received this from my card traders group that I belong to. Isn't it adorable!! I didn't keep a copy of the one I made, but it's the greatest card idea I've ever seen!! OK, to my faithful readers that have probably been looking and seeing the same card for two months now.... I promise to be better about posting. At least once a week minimum.